Blackberry needs 10.000 "top quality" apps and it'll beat the hell out of every manufacturer out there. Hihi, biz phone? No one phone came' close to NOKIA E7, no one! Just my opinion Kid's. Cheers. RIM tried their best. That's WHAT really matters in the end. RIP Bb. 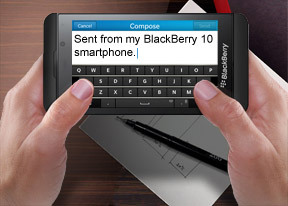 Thanks for all those nice qwerty business messaging phones! PC, 10 Feb 2013$999? Where did you get that fantacy price from? Its more like $650 without contract. You can't get it off contract yet, other than ebay for $999. Kumar, 11 Feb 2013Blackberry is just light years behind in terms of touch screen tech. Just look at the Bold 990... moreWas lightyears behind. They have now caught up and doing a dine job, I thought the same a few days ago, until I went into. Cpw and was playing around with a few phones, and I fell in love with the blackberry z10. Please don't knock it until u have tried it, such a fresh, fluid ui. Super smooth fast, fast browser. I was android before sgs3 but I was bored with ios and android, il give BlackBerry ago and see what happens. Battery's also better than my s3. Go check one out and then tell me you won't ever own a BlackBerry. A rocky time ahead for BB and a 2-5 percent market share depending on market (with developing markets favoring BB for now). While BB10 has much potential, it would require a miracle for smartphone users to abandon the major OS:s for BB10. The" swipe to right" hub feature is what stands out and it's way too little too late! A mediocre camera doesn't help much either. Once the BB app store matches the current selection of the two major platforms in a couple of years, the competition will be far ahead. IT LOOK NICE.....but, RIM is RIM......it need's significant update. andrei, 09 Feb 2013Gestures are very similar to N9... And the price is $999?!!! Let us see if BB can recover with... more$999? Where did you get that fantacy price from? Its more like $650 without contract. Is it me or sometimes the interface shows some slight lag, like eye noticeable lag. As I saw at one moment it takes up to 0.5ms to change between cards/panels. I don't know how to put it..it's like you have Ubuntu but your video drivers are not properly designed for Linux and you get a slight slower refresh. Even at typing it has a lower tempo than WP8 or iOS(I mean without using the swipe thingy). You can use any one of the volume rockers as the shutter key for camera when the camera is on!! !.